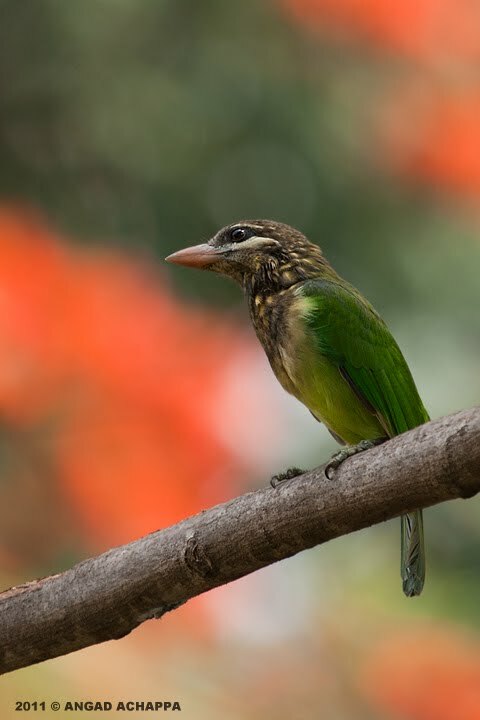 Come September - mid-October and the trees around my workplace are usually busy with bird activity, especially barbets. Its quite easy to spot them as the males have a very loud mating call which is constant during the afternoons. One can easily see them in pairs or even three of them together(as i quite often happen to see) during this period of the year. Unlike the Brown-headed Barbet, this species is mainly found in South India and has a broad white cheek stripe below the eye which distinguishes it from the former. I like the inquisitive look you have captured in this fellow...and the green coat against the coral background is a great contrast. SUBLIME...its splendid & graceful way of "posing" is just wonderful...!!! Lovely image of a lovely bird! That's a wonderful bird and the picture you got is splendid!! Well done mate. It is probably very nice to get such a bird hanging in the tress around your hosue! The bird and the background have an uncanny resemblance :) is that editing or that's how the background was? Oh, what a beautiful bird! And so are your photo with great colors and light. Angad, I took a look around your blog. Gee....I loved all your fine photos. You turn the birds/wildlife into Stars! It is fun to visit your blog and discover new birds and animals. Very colourful Angad, an interesting bird. I am looking after a baby bird with a broken leg.. n then i saw this pic.. n there he is..Can u tell me how can we distinguish male from female? do both have this loud call at noon? Can u tell me how to distinguish a male from female? Do both have the loud call at noon?